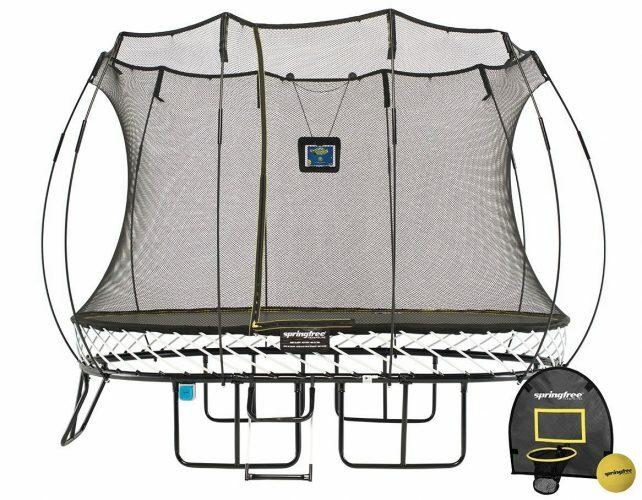 Springfree trampoline reviews: Springfree Trampoline is the latest inventory in our all-time favorite outdoor source of entertainment. These trampolines are almost similar to the ordinary trampolines but with a major difference being the highest level of safety. So, if you have also come across this world’s safest trampolines recently and looking for Springfree Trampoline reviews, we have got you covered. Trampolines are the most picked piece of play equipment when you have growing kids at your home. It is something that all your children can enjoy together almost every day whilst also staying physically active. These trampolines are brilliant for any active child who can relish jumping there for hours. But over the years, increasing rate of trampoline injuries has left parents worried about the safety of their children. They do not want their children being wounded in the upsurge of a rushing jump moment. This has previously led to the discovery of safety net enclosures which proved effective in reducing the number of unwanted accidents. And yet again, the safety issues have brought us Springfree Trampoline. Here is the complete comparison table of all the Springfree Trampolines. See all the Springfree Products Here. Invented by a concerned dad and frustrated doctor Dr. Keith Vivian Alexander, these trampolines are practicably very safe and give great bounce too. Here, you will find answers to all the queries that you may have regarding these innovative trampolines. We hope this genuine Springfree Trampoline Reviews will help you make a wise decision. The high-end design of this trampoline is amazing enough to enthuse palpable excitement in any kid or for that matter any adult too. It has a robust and very solid outer frame for the all-inclusive resilience of the device. One thing that excites the most about this trampoline is the complete eradication of springs. The traditional metal frame which used to come with a dense padding is also effectively replaced with a highly flexible system of vertical rods. These rods are fabricated from a versatile composite material and offer great bounce. All such components of the trampoline that were chiefly responsible for bruises and injuries are impressively eliminated. The jumping mat is soft and fabricated from high-quality fabric so as to remain hard-wearing for a relatively longer duration. Common head clashes with the net poles are completely removed because of the flexible pole system that holds the net enclosure. The strong and durable safety net moves along with the falling jumper effortlessly to direct him back to the center. The inside of the trampoline is also built free of any metallic and hard objects. Overall, the design looks seamless and extremely safe for anyone who is looking for a fun yet safe time while trampoline jumping. 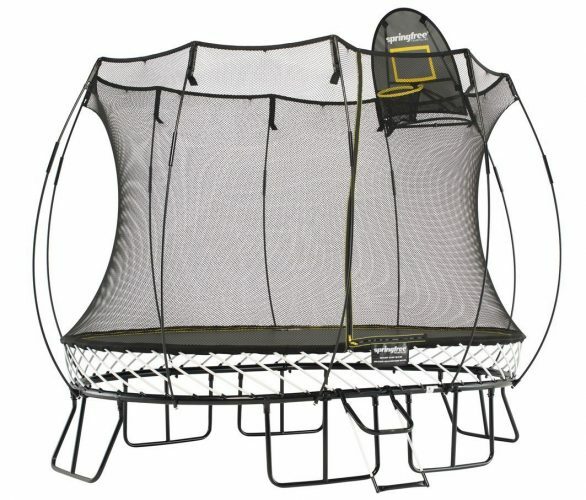 Springfree Trampoline is available in several shapes while round being the most popular. The round shape trampolines have become widely popular among the masses for all the great deal of benefits they provide. Sizes are also manufactured according to the needs of the users. There are various sizes ranging from small to large. The common sizes that you can consider for your family are 8ft, 10ft, 12ft, 14ft and 16ft depending on the number of jumpers you have. 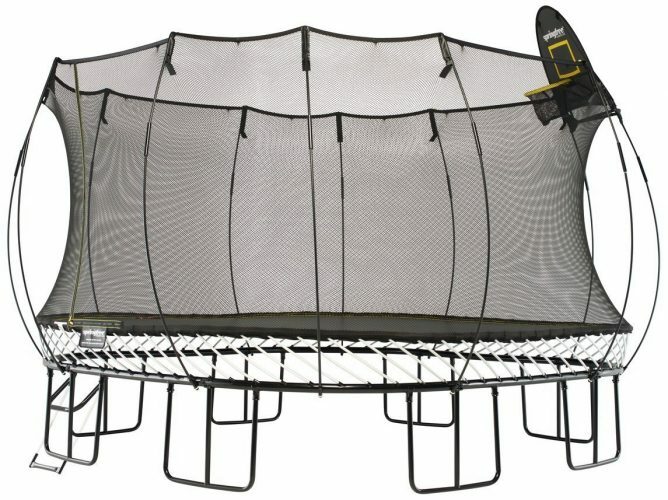 All these sizes are manufactured with the same aim in mind, and that is to provide maximum safety to trampoline lovers. The enhanced safety of this trampoline comes from its complete eradication of pointy springs. Like any other trampoline, they are equally bouncy, fun and great sports equipment. The removal of springs and poles has reduced high numbers of impact injuries. 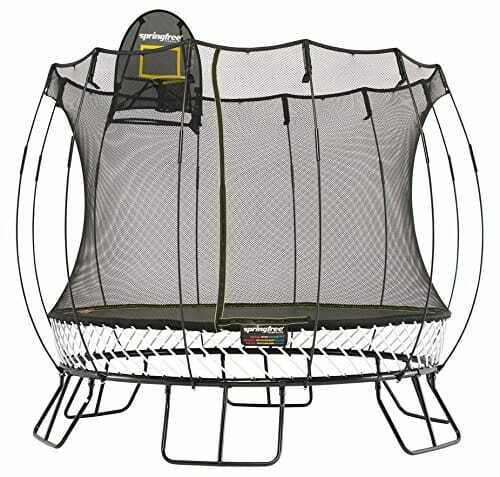 Instead of those springs, these trampolines have flexible and lightweight rods that provide high lift bounce and are placed below the outer frame. These composite rods are very efficient in giving right bounce and lift to the user. Thus, there remained no chance of risky springs bruising the soft skin of your loved ones. Again, the poles holding the net enclosure are built far away from the overall trampoline structure. This saves the user from hitting the hard poles directly. In fact, they are being considered as the safest trampolines available in the market at present. All the great flexibility that this trampoline feature is because of its premium material. The composite rods and spring-free jumping mat retain the same level of jumping experience as you may have with ordinary trampolines. This trampoline is also extremely durable and will last for several years because of its solid construction. Its frame is also sturdily built so as to bear enormous weights according to the weight capacity of the trampoline. The legs of the trampoline are also immensely robust and provide unwavering stability to the overall structure of the trampoline. It will never show any structural twisting even after heavy-duty use. None of this trampoline’s part is liable to show rusting or corrosion which makes it durable and weather-resistant too. Considering all the innovative and remarkable features of Springfree trampoline, it is obvious that they are very expensive. But bearing their safety aspects in mind, the investment seems quite worthwhile. These trampolines come at a great price as when compared to the ordinary trampolines that we have. But now you have read this thorough Springfree Trampoline Review and must have known what makes these trampolines expensive. You must never compromise the safety of your family for the sake of a couple of dollars. If you can easily afford to pay a little more, go for this safe and great trampoline. The high price is simply because of all the extraordinarily good components utilized in their construction. Everything that is incorporated in this trampoline is exceptionally good. From solid construction to the top-quality material, everything makes the equipment worth buying. The trampoline is extremely safe for both adults and kids. It prevents accidental falling of the jumper due to Flexinet. Fiberglass rods and gentle mat considerably reduce the hard impacts of landing. They have lessened the number of trampoline injuries to almost 70%. The trampoline is very durable and hard-wearing. The springfree trampoline problem may come from someone being deliberately trying to hit the ground while landing on the net enclosure or when someone happens to jump over someone unknowingly. Otherwise, there are not many disadvantages associated with this trampoline. These cons that come with our lack of awareness are easily manageable and can be sidestepped. This trampoline has slightly higher price than other traditional trampolines. The assembling of the device takes longer than usual. 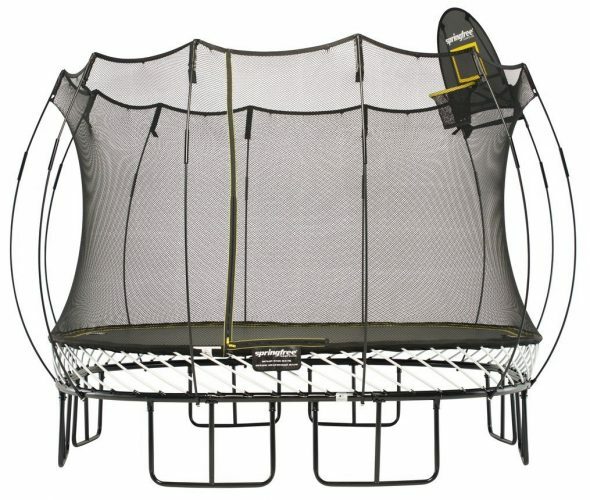 The advent of Springfree Trampoline has efficiently brought a revolution to the old world of spring-based trampolines. These trampolines come without springs that are effectively replaced with either elastic bands or fiberglass rods. You can totally trust them for the safe jumping experience of your kids. They have retained all the good features of traditional trampolines and have further improvised the overall entertainment approach. 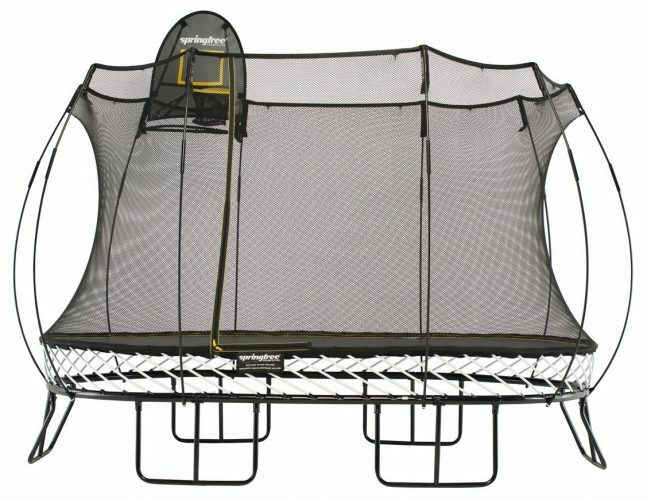 This Springfree Trampoline Reviews has covered everything from their designs to the high level of safety they offer. If you are too eyeing for purchasing this trampoline, there are all the good reasons that you do so. Bring unlimited and safe fun to your family with this trampoline and say goodbye to the unsafe springs.